(Phys.org)—Since a gazelle can run faster than a lion, how do lions ever catch gazelles? A new model of predator-prey interaction shows how groups of predators use collective chasing strategies, such as cornering and circling, to pursue and capture faster prey. Without this tactical collaboration, the predators would have no chance of catching these prey. The results are not only relevant for understanding wildlife, but also have potential applications for drone-flying strategies and in the entertainment industry. The researchers, Milán Janosov, Csaba Virágh, Gábor Vásárhelyi, and Tamás Vicsek at the MTA-ELTE Statistical and Biological Physics Research Group, Hungary, have published their paper on their new model of collective chasing strategies in a recent issue of the New Journal of Physics. "After many previous efforts, we managed to give a simple, yet surprisingly life-like explanation of how predator animals can form successful hunting packs, and by that drastically enhance their chances of being successful on a hunt," Janosov told Phys.org. "This is particularly interesting because we managed to model these exceptionally complex systems—the hunting groups of large carnivores—in a simulation resembling realistic features of animal pursuits, such as encircling, optimal group size, and finite space, only by using a set of compact rules formulated as force-like interactions in physics." Although there are other models that describe predator-prey interactions, the new model is different because of the large number of factors it accounts for, such as the prey's panic threshold, the predator's ability to predict the prey's future position, and the interaction between multiple predators, within closed boundaries with realistic measures. All of these parameters contribute to making a more realistic model that accurately describes behaviors observed in nature by groups of predators such as lions, wolves, and coyotes. 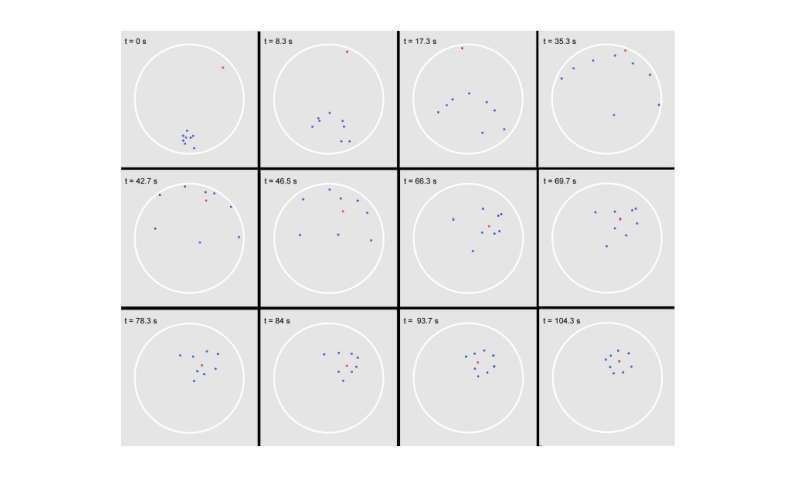 By running simulations and measuring the effectiveness of different combinations of parameter values, the researchers determined the optimal combinations that resulted in the most successful group chasing strategies. Among their results, they found that just one or two predators can never catch a faster prey, and that groups of three or more succeed only with certain collaborative strategies. The model revealed that three predators forms an optimal group when chasing in two dimensions (such as on land) in a confined space. In three dimensions (such as in the air or under water), chasing becomes more challenging, and groups of five are optimal. These group sizes are comparable to those observed in nature. Somewhat surprisingly, the researchers also found that an odd number of chasers does better than an even number, which is due to geometrical reasons: with an even number, it's more likely that a gap remains between predators that allows the prey to escape. 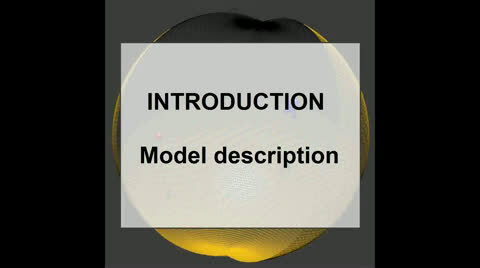 In their model, the researchers also observed emergent behavior, which is behavior that appears only in groups. In particular, groups of predators often begin to encircle their prey, and this behavior arises directly from the chasing rules. In nature, it's common for prey to sometimes run in a zigzag pattern to confuse the predator, and to eventually run directly away from the predator in a straight line. The researchers also observed these strategies in their model, and found that zigzagging is especially advantageous when the predators have a long delay in responding. In the future, the researchers expect that additional interesting results can be obtained by modifying the model, such as investigating situations with multiple fast prey and equipping predators and prey with machine learning algorithms. "Our major goal in this research was to gain a deeper understanding of the collective behavior of animals, to extend our knowledge on fundamental questions on animal behavior," Janosov said. "However, given the fact that our research group is developing collective motion algorithms for our flock of quadrocopters, there are plenty of potential applications we could propose. For example, a group of tactical drones using smart encircling strategies could become even lifesaving in the case of terrorist attacks, when the goal is to capture terrorist flying vehicles, or chasing criminals in narrow, highly populated urban areas. "Besides these, our results could have potential applications even in the entertainment industry in developing field games, possibly combined with virtual reality tools, or by the streaming of popular sport events, especially those that are widely spread in space—for example, bike or car races." HAHAHAH A drone scenario? HAHAHA What a pathetic attempt to get readers of junk. This is garbage. I don't use an ad blocker any more. I filtered them a bit courtesy of Google Ads, bu I still have issues. I am particularly annoyed by moving ads. Whatever moves on screen doesn't let me concentrate on what I am reading. I don't care about products that are advertised in over 99% of cases. I don't remember to have bought something that was advertised. Now since I come here to read, I think that some written ads would be far more appealing here (less annoyance, more of the same stuff I follow). Plus they would take far less bandwidth.